I has only been about a week since I posted L is for Little Machine Beer. This blog post marks the shortest turn-around between articles in my A to Z Denver Breweries series. 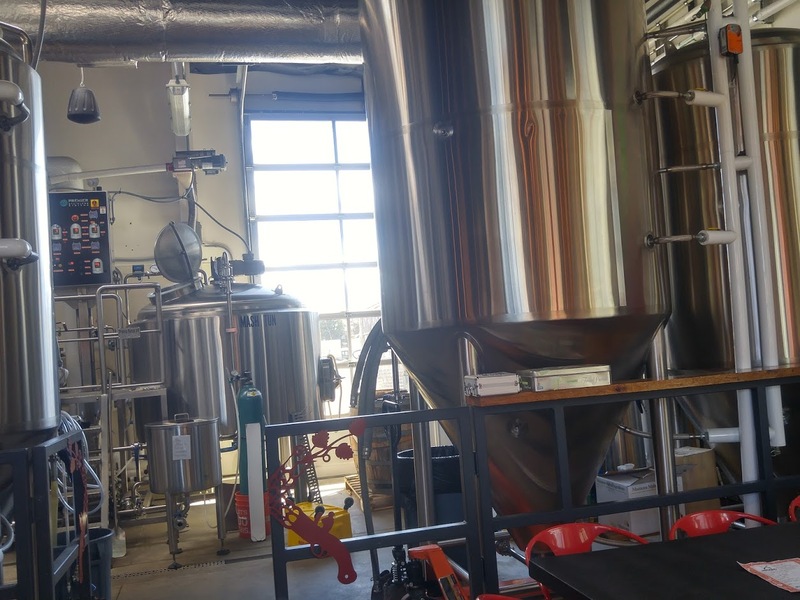 What is this series of A to Z Denver Breweries? you ask? The most recent one was L ... L is for Little Machine Beer. There are 8 in between which you can review by looking at Sheppy's Blog: A to Z. If you know your alphabet, you probably can figure out that the letter M is up next. 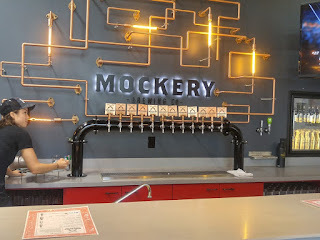 "The only thing we take seriously is beer"
Mockery’s brewing philosophy started out simple, delicious and unique. 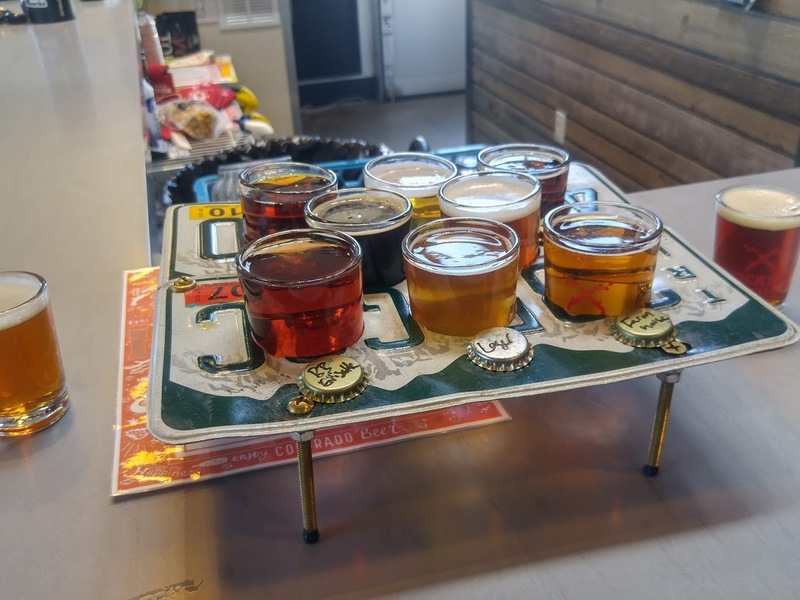 We didn’t want to adhere to any restrictive beer laws or specifications, but rather focus on bold flavors and quality beer we enjoyed to brew. Mockery is located in the River North area of Denver at 3501 Delgany Street Denver, CO 80216. They are in a cool little modern-looking garage space. It has a cozy neighborhood vibe with seating both inside and out. There were not very many people there just after noon on the Sunday I stopped in, but I suspect that it is usually pretty crowded and busy. I got a flight of 10 beers, which was all that they had on tap. Slightly different than what they have on their "on tap" page. The Ultimate Session Beer -- "English Style Old Ale". I usually associate "Old Ale" as bigger in ABV, but I really appreciated the nice malty profile in a lower ABV beer. Delicious. Mandarina Bavaria -- A very nice crisp German Pilsner with decent noble hop flavor. One of those beers you can drink a bunch of. Salted Scotch Ale -- Untappd refers to this as a Wee Heavy, and unless someone corrects me, that is what I'm going to say it is. If it contained salt, I didn't notice in the flavor. Oaked Southern Hemisphere -- "Black Pale Ale". I thought this was interesting (and awesome). It wasn't really overly hoppy. It had a nice chocolate overtone. Nice beer. Mango Session IPA -- Mango. My favorite of the flight. Personally, I prefer to call these hoppy pale ales, but brewers can call them whatever they want. This is the beer I got a pint of after the flight. Boysenberry Grisette -- Lots of fruit flavor and not much else. I think this was my least favorite of the flight, but I'm sure lots of people love it. 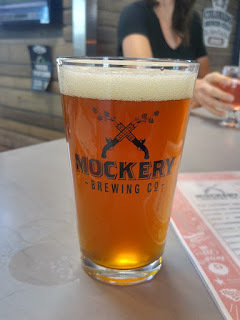 Mockro Lager -- I guess this is a Dortmunder (if untappd has it categorized right). Nice and clean flavorful lager. Good stuff. Farmhouse Ale -- Very easy-drinking farmhouse ale. I could easily drink a ton of this and be very happy. Nothing all that wild about this beer. Just yummy. The Redcoats are Coming -- Another "Session IPA". I didn't think it was as good as the Mango, but still awesome. I think this might be the "Session IPA" brewery. Fresh Hop Brown IPA -- Nice hoppy brown ale. Lots of good fresh-hop flavor and aroma. Another yummy beer. 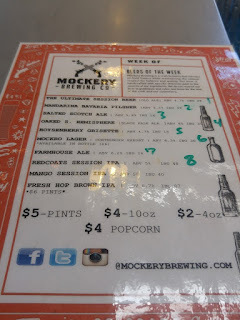 In case you couldn't tell from my descriptions, I really liked all the beers. I thought their "Session IPAs" were excellent. Most everything else was great too. The Boysenberry Grisette was the only beer that I didn't really care for, but as I mentioned above, I bet lots of people love that beer. I would be willing to bet that it would be my wife's favorite. I enjoyed sitting at the bar. The televisions had NFL Red Zone on. I actually got to see a fair amount of the Bears beating the Lions. How pathetic are the Lions if the Bears can beat them? 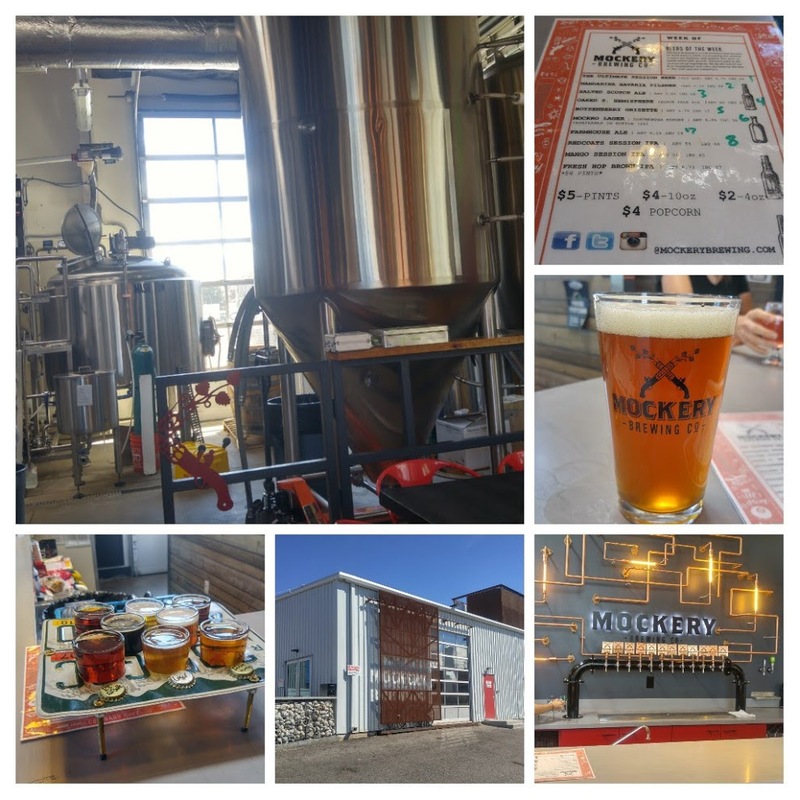 This is another great Denver brewery. I am sure I will try to return at some point if I find myself in the River North area. I suggest you stop in and try some of their beer as well. There are a couple of cool activities listed on their website that I thought I would share .. 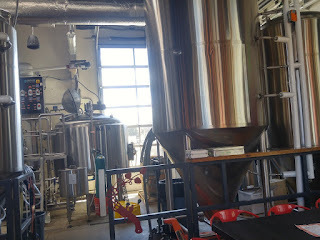 BREW DAYS - Want to learn to brew? Mockery Brewing offers brew days for groups or individuals who want to learn to brew beer. We provide equipment and ingredients. 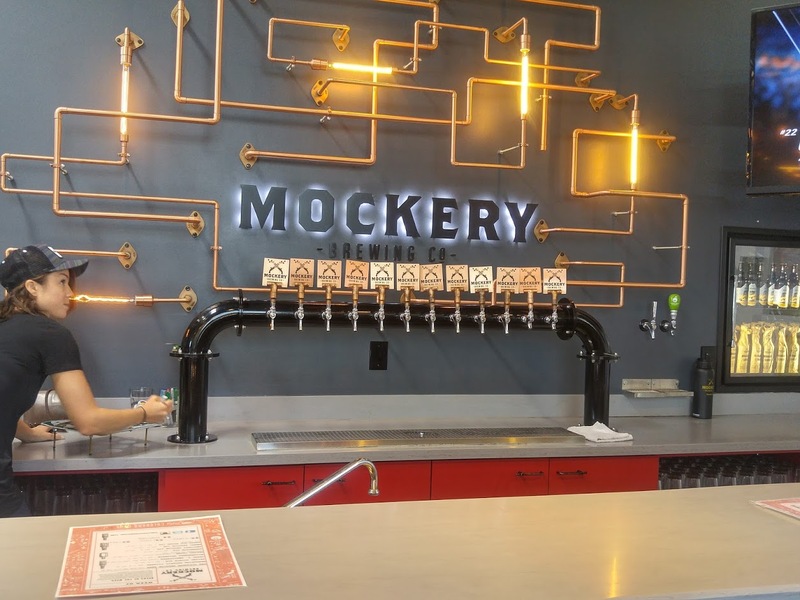 PRIVATE EVENTS - Mockery Brewing has a 1000 sq ft garage that can be rented out for private events. 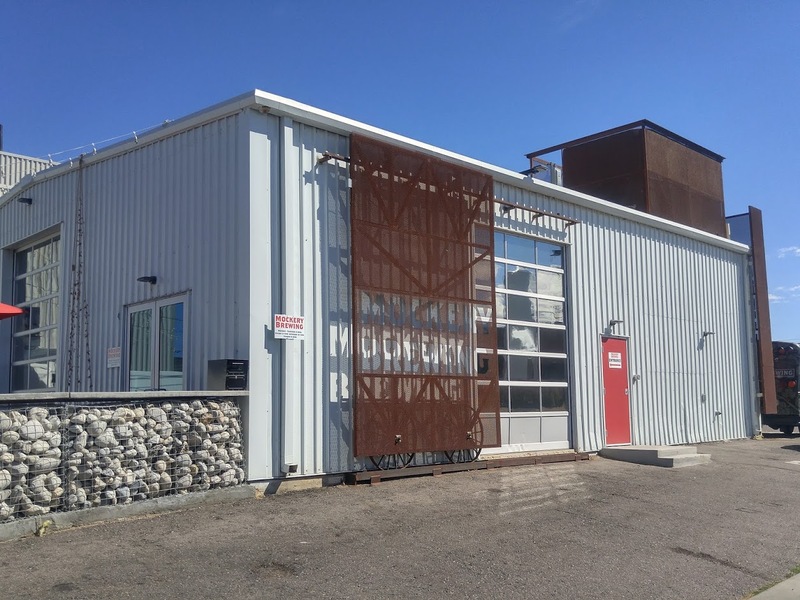 TOURS - Please contact the brewery if you would like a private tour and tasting. At some point I may take advantage of these. And now ... next up is the letter "N". I have a brewery in mind. 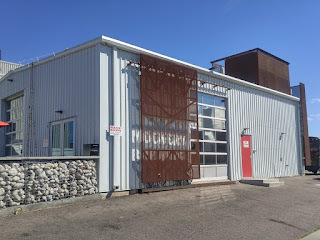 Hint ... it is a new brewery. It had its Grand Opening on October 1st. Care to guess what it is? Leave a comment below. As always, you can find out what I pick for "N" (and the rest of the alphabet) by bookmarking "Sheppy's Blog: A to Z".